This is simply the best Herb Roast Potatoes Recipe. 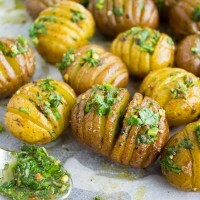 Picture herb butter smothered Hasselback-style potatoes roasted till crispy on the outside and tender on the inside. If I could have potatoes every day, I would. I just love them. And I am never picky! Fried, roasted, mashed, boiled, stuffed, however. 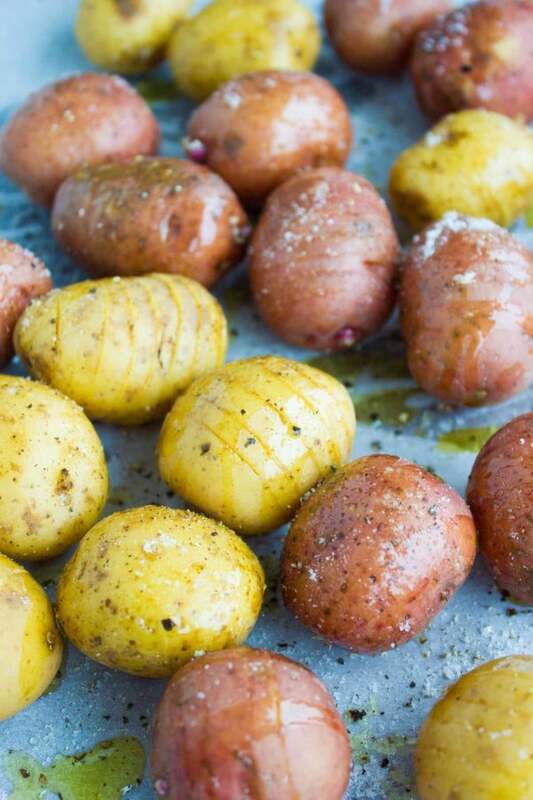 These best herb roast potatoes are one of my favorites. I bet if you try them, they’ll be your favorite too! 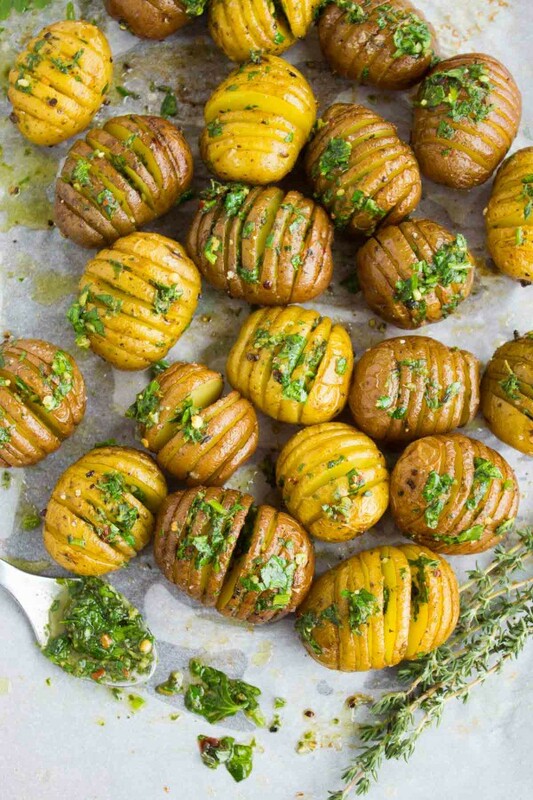 These Herb Roast Potatoes are sliced Hasselback style and roasted till crispy on the outside and tender on the inside. 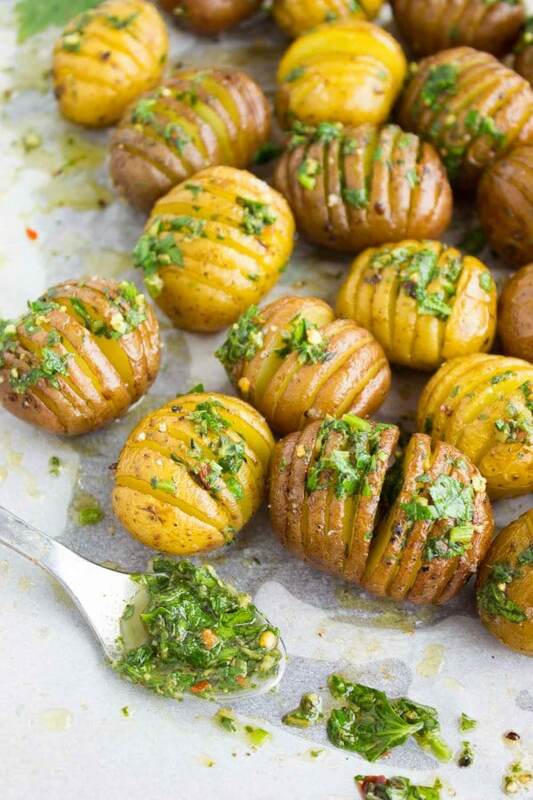 When roasted, they are brushed with a sweet herb butter on the outside and inside each slice for maximum flavor, and extra juicy buttery feel to perfectly compliment the potatoes. This recipe is the perfect side dish and my go-to potato recipe for potlucks and date nights! I love to serve these Best Herb Roast Potatoes with chicken (hint: this easiest garlic herb roast chicken). Place each potato on a flat countertop. Take a small knife, slice along the potato thin slices of about 1/16 inch thickness making sure not to go all the way. Slice about halfway deep into the potato. Slicing each potato Hasselback-style like that needs a bit more time, say 10 mins. But it saves you 20 mins of oven roasting time. So not only does it even out, it’s actually better because of the amount of flavor you’ll infuse into each slice of the potato when roasted. Roast the potatoes in the oven for about 20-25 mins until tender on the inside and crispy on the outside. In the meantime, place all the butter ingredients in a small bowl and mix them well. Once the potatoes are out of the oven and still hot, take a brush or small spoon and divide the butter evenly on the tops, sides and inside each slice of the potatoes. Do you remember this fabulous grilled steak with rosemary lemon butter ? This recipe for herb butter follows the same concept, and you can absolutely flavor the butter with whatever you have on hand, or however your taste tells you to! I love butter, fresh thyme, fresh oregano, fresh parsley, fresh basil, a pinch of red paper flakes, pinch of salt and pepper, and nothing else. But lemon zest would be fabulous here. Or nutmeg, capers, jalapeño, parmesan cheese. Really, anything you feel like! Even a mixture of butter and olive oil can be used as a base. 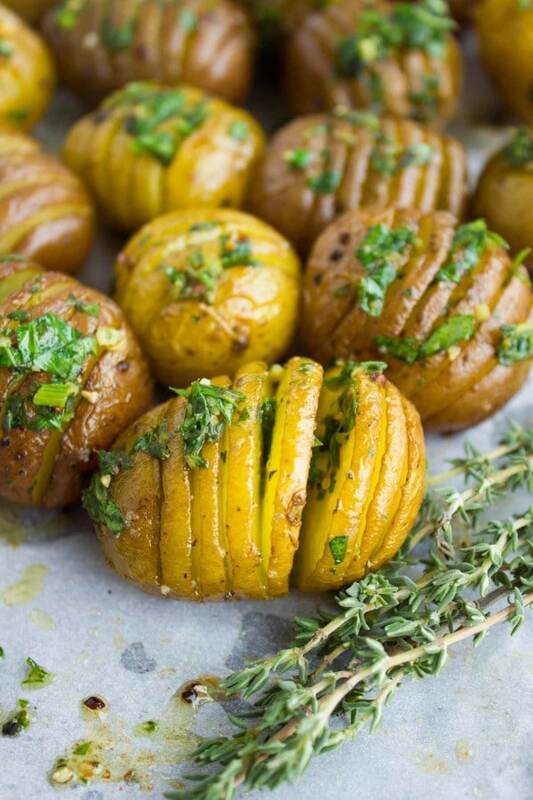 The whole idea is to infuse your favorite flavors into these best herb roast potatoes! Looking for more potato recipes? These mashed potato rosemary crisps are another potato favorite – a cross between potato cookies and rosemary mashed potatoes. Simply DIVINE! When slicing the potatoes, the easiest way to do so is to place your potatoes on a flat surface and hold it on one end. Take a small sharp knife and start slicing about 1/16th inch thin slices (or like 3-4 mm) making sure you don’t slice all the way to the end. Aim for just a little more than half the depth of the potato. When you reach halfway slicing through the potato, switch sides so that the sliced end is furthest away from you. Before baking, these best herb roast potatoes will look like they need deeper slicing but don’t be tempted to that. The slices will open up or fan out during baking. Just give them a nice seasoning of olive oil, salt and pepper and they’re ready to bake. 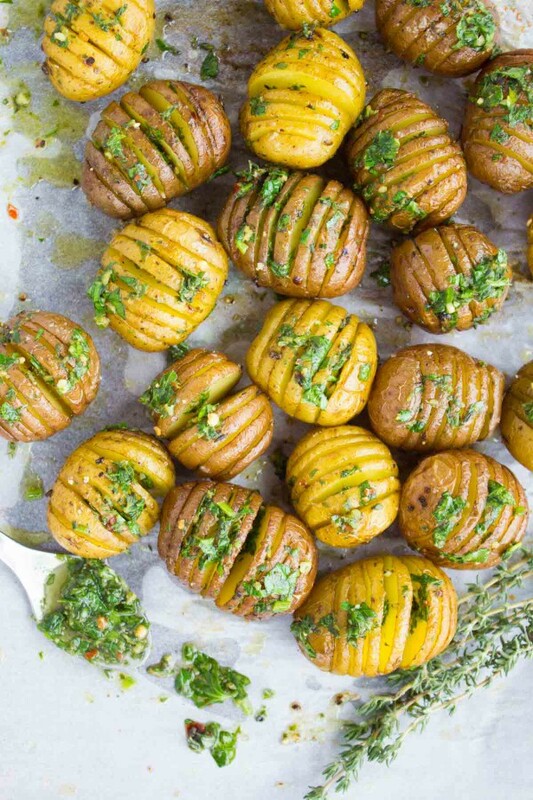 Once the Herb Roast Potatoes are baked till crispy on the outside, and tender soft on the inside, and while they’re still hot out of the oven, take a spoon and place a bit of the butter mixture on the outside and inside of each slice to take them to a whole other level of roast potatoes! This is simply the best Herb Roast Potatoes Recipe. 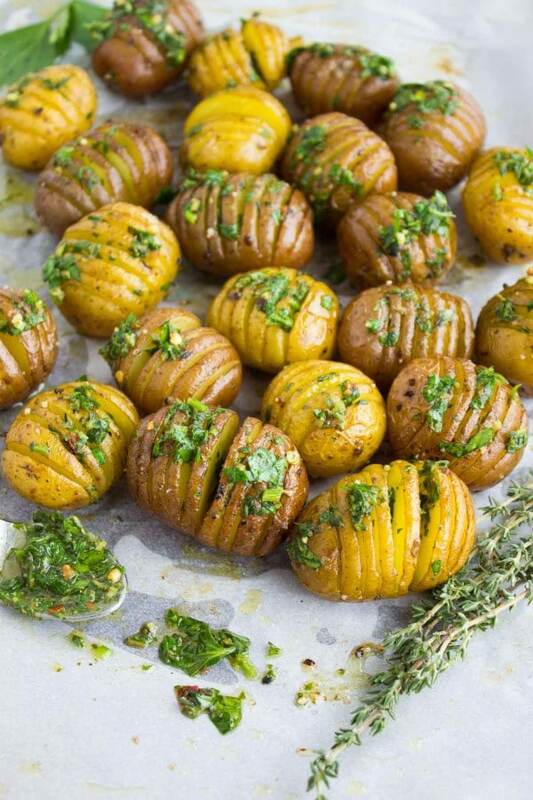 Picture Hasselback-style potatoes roasted till crispy on the outside and tender on the inside. 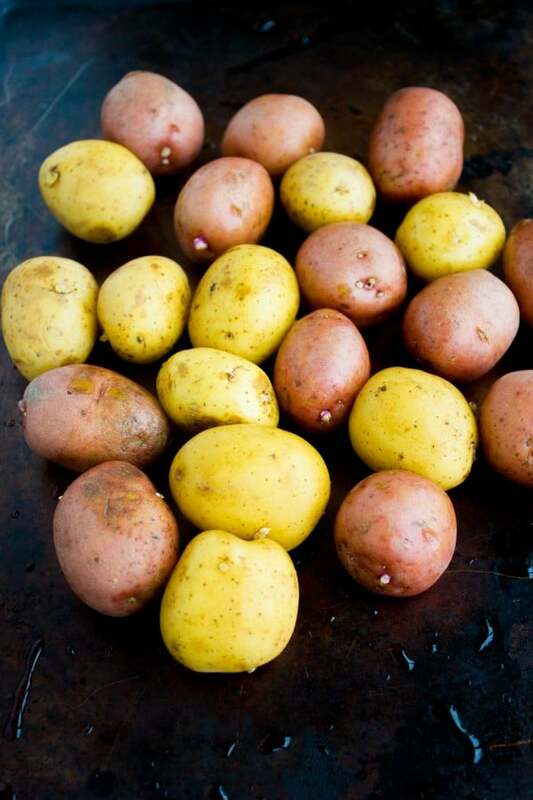 Place each potato on a flat countertop. Take a small knife, slice along the potato thin slices of about 1/16 inch thickness making sure not to go all the way. Slice about half way deep only along the potato. Thanks so much:) So glad you liked this! These look amazing and taste fantastic. Worth it! Yaaay!! Thank you Chrissie! So glad you both enjoyed these! The perfect side dish to make. Nice and tasty! Looks absolutely sensational! I’d love to try this, it’s one of my favorite side dish! It’s totally worth it Melanie!! My whole family loves roasted potatoes. These looks so inviting. We should try your recipe! Love the flavor of these roasted potatoes! So easy and sooo good! I bet those fresh herbs make these SO flavorful! I totally agree on potatoes at anytime! 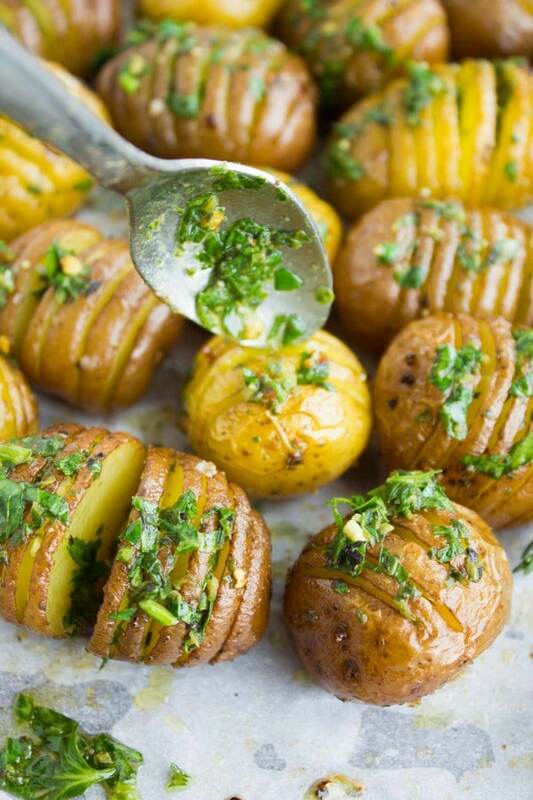 Those herbs on top of your little potatoes- that looks so incredible! I would love to serve these with a grilled steak. 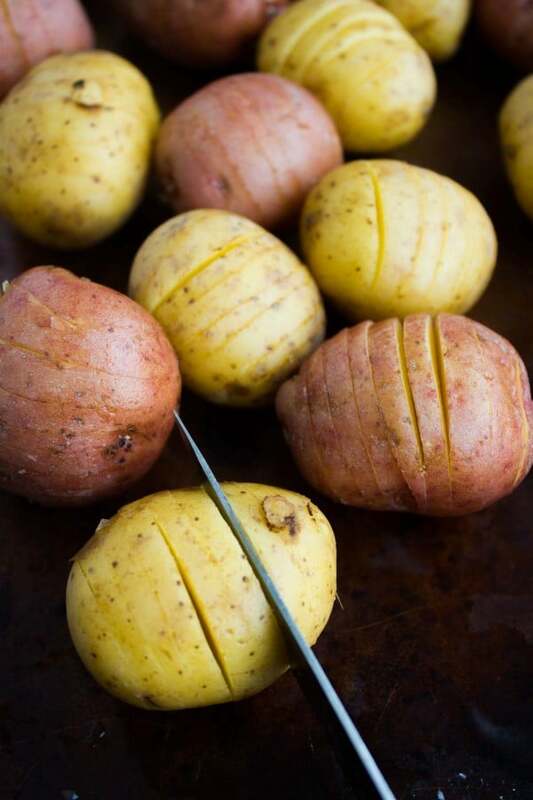 Potato is our family vegetable!love this deliciously done gorgeous looking potatoes! Wish i could grab these cuties from the picture!! I m definitely making this sooner! Priya yaay you’ll love them!! I love that you slice the potatoes to let the butter and herbs go throughout it!! These would be a delicious addition to my Easter menu this year! They’re the best side dish you’re right Melissa! 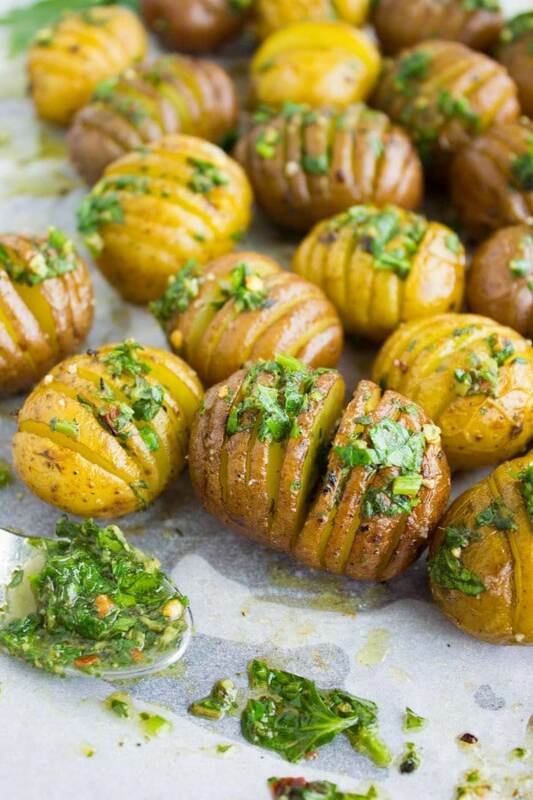 This perfect herb roasted potatoes. I like herbs and potato combo. Is potato are really versatile it combines very well with herbs. Isn’t roasted potatoes the best?? Those potatoes look absolutely perfect! Will have to try them out this weekend! It’s a must try recipe! Thank you!